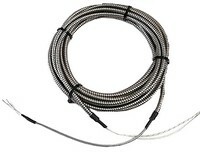 Extending Leads for connection Type K Thermocouples to instruments. Flat twin PVC cable with miniature size thermocouple plug at one end and miniature size thermocouple socket at the other. 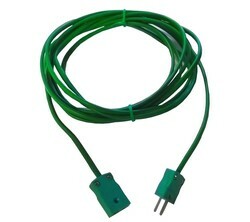 Thermocouple extension lead designed especially for high temperature and moisture environments. This Type K Extension cable is manufactured from 19/0.2mm PTFE insulated cable with Fibre Glass sheath and a stainless steel overbraid to give a total length of 7600mm. It is fitted with a protective conduit made from a stainless steel armoured sheathing extending 7100mm with high temperature seals at both ends making it particularly well suited to high temperature environments. 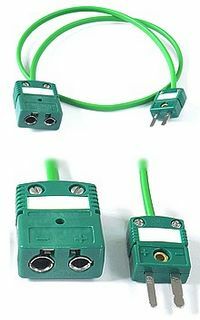 Each end of the cable is stripped of its braiding for termination purposes and for ease of use for its inteded application.